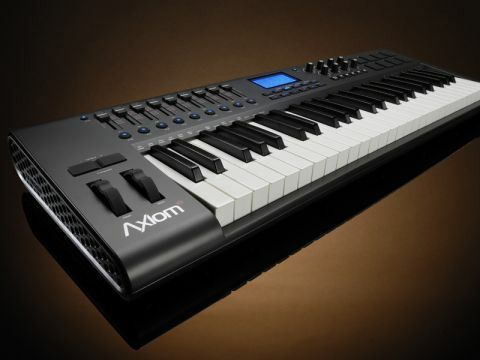 With sleek looks, more controls and 'DirectLink' with your software, does the Axiom rock hard? Any MIDI keyboard can make your copy of GarageBand or Logic come to life. But in a crowded market of bargain-priced 'boards you need something with that little bit extra. M-Audio's Axioms have been around for years and last year the new Pro line added the ability to control your software directly from buttons on the keyboard. This feature has now filtered down to the more affordable Axiom 61 (£305), 49 (this model) and 25 (£195). So, rather than have your mouse in one hand while your other belts out Bach, you can pretty much forget your computer and get on with making music. It's M-Audio's DirectLink that's the star. A quick install and the Axiom found our Logic setup (we had similar success with GarageBand and Ableton Live too), and all the obvious features such as track levels and pan appeared on the keyboard's controls. And if you use complex third-party plugs, you can get locked into the world of control changes and make any dial do anything in your DAW. It works too, and after grappling with controllers that promised the earth only to glitch and grump, that's the biggest praise we can give. The Axiom's keyboard is 'ultra-expressive semi-weighted', but this amounts to it being very firmly sprung in the initial stages and rather 'clacky' and weak when depressed. However, the large angular profile does help fool the senses into thinking you're pressing something more piano-like. The drum pads are well-sized but spongy. Likewise, the rest of the rubberised controls require a good push to operate. That said, compared to the frail plastic on other keyboards, this is much more gig-resistant. You're paying for something just that little bit more 'pro' here, but it's worth the extra.